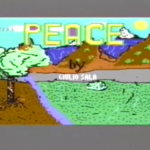 Peace was a war based simulation game being produced in Italy back in 1984. 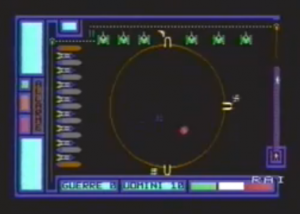 It was flagged up to us by Fabrizio Bartoloni after a YouTube clip from an 1984 TV show Orecchiocchio was uploaded with a clip from the game (which you can see below). The developers spoke on the show and then proceeded to demonstrate their game. The developers are known as Luca Milani, Marco Corciulo, Giulio Sala and Ostir Lido (?). We are unsure at present of the order of those credits and who did what. 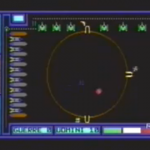 The game itself looked very promising for a 1984 title, and had some good sounds and graphics throughout. We are guessing that they were trying to find a publisher for the game – but it seems for reasons unknown it never got one. The game looked pretty much complete on the TV show, but we do not know for certain if they demonstrated a finished game. What happened to it though? Can it be saved from obscurity? It is hoped that we may find and track down the developers who may still have it. It’s early days yet.